school’s bullies. But Cosmo comes up with the idea of forming a band because he wants to impress pretty 16-year old Penny (Maria Doyle Kennedy) who he spots sitting on her stoop at a girl’s boarding house where she lives. Cosmo immediately takes a liking to her but she says that she’s going to become a model and is planning on moving to London with her ‘adult’ boyfriend. But Cosmo is really keen on her and to impress her, together with his mates, they form the Sing Street band, but there’s a small matter of sourcing instruments and getting others (preferably talented) to join. After lots and lots of practice in a friend’s living room, Sing Street actually become very good. But Cosmo is still keen on impressing Penny, so he and the band invite her to star in their music video, made on the very cheap. As Sing Street continue to get better and better, and with fellow band members, they become local celebrities. With Cosmo’s no good for nothing brother Brendan’s support (Jack Reynor), who was never actually able to follow his dreams of leaving Dublin, Sing Street continue their plans to be successful and to conquer Dublin. Sing Street is a good old-fashioned rock musical that could’ve been made with the Monkees back in the 1960s. But it’s now 2016 and Sing Street is an entertaining throwback to that era and captures the look, feel and sound of the ’80s wonderfully. Sing Street really works thanks to a great young cast and crisp direction and writing by John Carney (the Oscar-winning 2007 film Once). 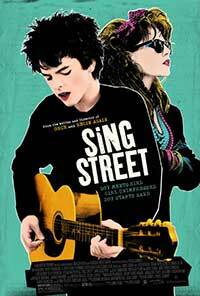 But it’s the music in Sing Street that will get you to tap your toe and to hum along. Music by the real actors in the Sing Street band in the film, Duran Duran, Hall & Oates, and Adam Levine make this musical comedy-drama a must see.